Performer. Curator. Hostess. Event Planner. Fundraiser. Collaborator. Below is a brief summary of the work Natali has done in these roles. Boogaloo Radio - Postpop feature as Hands talking about my Record Store Day 2018 song, Shine, and the process of writing, recording and releasing a record in 24 hours. A list of some of the London Venues where Natali has performed her music: Monto Water Rats, The Finsbury, Pitcher & Piano (Richmond), Zigfrid von Underbelly, Fiddler’s Elbow, Old Queen’s Head, Passing Clouds, The Hive (Bad House Films), Toulouse Lautrec (She Can Jam), Lion Coffee Records, ICMP (Institute of Contemporary Music Performance) graduation ceremony, Inky Cuttlefish. Some of the many South African Venues include; Beacon Island Hotel, Surf Cafe, Bitou House Polo, The Plettenberg, Rhino Base Camp, Thesen Island - (Plettenberg Bay), Dizzy Jazz Cafe, Kirstenbosch Botanical Gardens, Mount Nelson, Obs Cafe (Like Honey), Royale Cafe - (Cape Town), Girls Rockin’ the Road Tour (various cities in SA). Natali has also performed Internationally for private parties and live music venues including places like Sydney (Australia), Cannes, Antibes (France) and Palma de Mallorca (Spain). Natali performs originals and covers and is gifted in reading a crowd and getting a party going. Be it as a solo artist or with her band, she is guaranteed to make your corporate function, private party or special occasion an event to remember. Latitude - She Shine On. 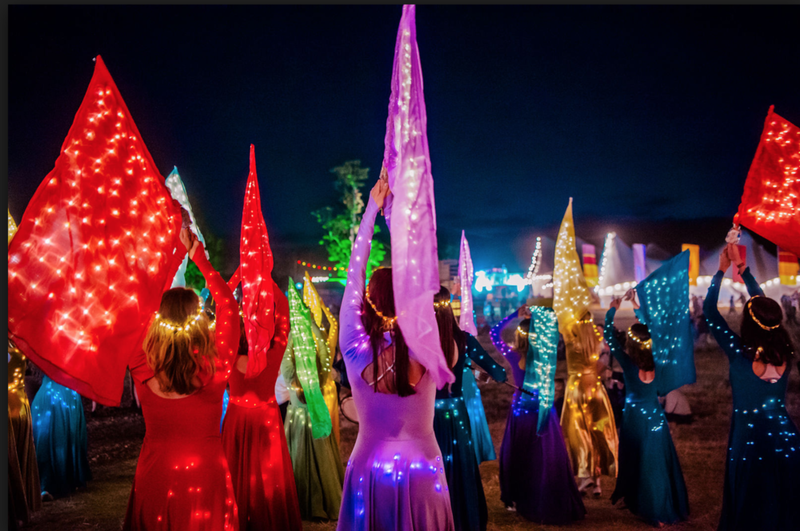 Twenty exquisite Light Emitting Dancers perform an illuminated flag parade at the multi award winning Latitude Festival 2018. Produced in collaboration with artist director Ami Jade Cadillac, the piece was accompanied by the work of composer Joji Hirota, performed by London Taiko Drummers. Zigfrid Von Underbelly - Hands. Before a gig as her musical alter ego, Hands, Natali dressed up in a bodysuit she designed which had lots of hand shaped outlines on it. She walked around with neon paint and a rolling brush and encouraged her fans and future fans to stamp their own hand print on to her bodysuit. Edward Ofosu - Live Performance Painting. Collaboration with Ghanaian Artist where he painted her live performance on his Ipad. This process was used as the real time visuals for the duration Natali’s performance. Silk Series Colour Walk - Spitalfields, London. Phannatiq ramp model and brand promoter. F.Empower - Monthly event for female creatives in E17, London. Hostess, organiser. Ladies of Quirk - Showcase Event at Richmix, London. Responsible for promotion, planning and performance. Cozy Acoustics - Weekly acoustics showcase night, Southwest London. Promoter, hostess and curator.